In the times before indoor plumbing many homes had a white chamber pot that was usually kept in the bedroom and used as a toilet during the night. Chamber pots have been used by humankind for thousands of years. One of the earliest known examples of a chamber pot was discovered by archeologists at the Tel-el-Amarna site in Egypt and dates from the 1300s B.C. Other early examples of this utilitarian vessel that have been found are attributed to the ancient peoples of Sybaris and Roman. Although chamber pots remained fairly similar in style throughout the centuries, they did undergo slight changes in design. By the 1500s, chamber pots had developed into the styles and designs that are most recognizable today. In colonial America most of the chamber pots were made of earthenware that was lead glazed and had a slightly coarse texture. The glaze turned the inside of the pots a reddish color as it oxidized. 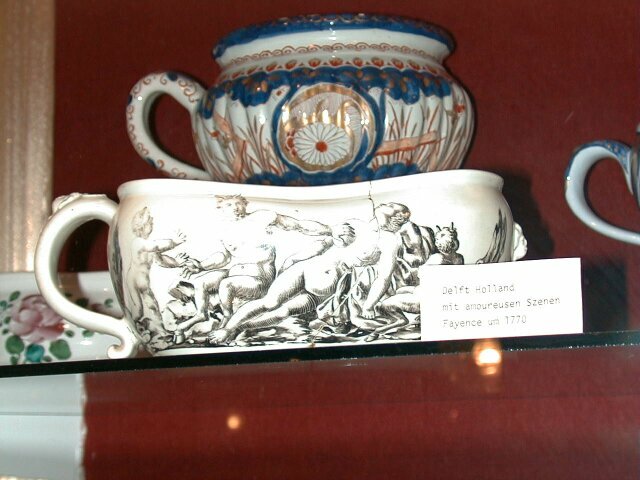 Although this type of rustic pottery was patterned after the silver styles popular in Europe, it was not as attractive as the delicate delftware chamber pots with their tin glaze and creamy white appearance.In the mid 1600s a number of Staffordshire potteries began to mass produce chamber pots, exporting many to the colonies. The Staffordshire pots were very affordable and many have been discovered at colonial sites. During the Victorian era, chamber pots were kept under the bed, inside a night table or placed inside a cabinet that had a cover that opened and closed. At that time, ceramic chamber pots decorated in colorful floral designs or beautiful scenes were very popular. A gorgeous example of a Victorian chamber pot, circa 1896, is a flow blue floral design that is made more stunning by the applied gilding. This beautiful piece by John Maddock and Sons clearly illustrates the delicate style of the Victorian handle. An example of an ornate Victorian chamber pot is found at Bath Antiques Online. Dating from the 1890s, this lovely vessel has a beautiful two-tone blue transfer floral design. For a look at a few unusual antique chamber pots, see Munich's Das Zentrum für Aussergewöhnliche Museen, which translates to the Center for Unusual Museums. The museum, referred to as ZAM, devotes a separate room to its chamber pot collection called the Nachttopt- Museum. There is also a room, called the Bourdalous- Museum, which houses ZAM's collection of special chamber pots designed especially for females, called bourdalous. There is a great variety of chamber pots available from online antique shops and auctions. The following is a small sampling of these websites. 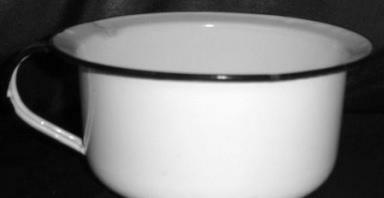 A white chamber pot is often a unique addition to an antique collection. A chamber pot also makes a wonderful decorative piece displayed on an antique washstand or used as a planter.